While some metal bands release half-hearted, lackluster albums, there are bands who are producing amazing albums that go unheralded and under-appreciated. They toil and produce heavy metal music with an unparalleled drive and determination. In case you didn’t know it, you are living in the age of such a band: DEATH DEALER, who have just released their explosive second album (the follow-up to 2013’s excellent debut War Master) on the Sweden Music Group label. DEATH DEALER is an alliance of five metal gods: You’ve got Ross The Boss on guitar, a giant who played on the first six MANOWAR albums, which are all classics. Also on guitar is Australian shredder Stu ‘Hammer’ Marshall, former DUNGEON guitarist and metal mastermind behind EMPIRES OF EDEN. On bass, there’s Mike Davis, who has recorded and toured with legends like Rob Halford and LIZZY BORDEN. On drums is new member Steve Bolognese, who has played with technical bands like INTO ETERNITY and BAPTIZED IN BLOOD. And on vocals is one of metal’s most underrated and hardest-working frontmen, Sean Peck, who has sung for WARRIOR and CAGE, among others. He has no less than three albums with three separate bands being released this year, Hallowed Ground being the first of them. The DEATH DEALER sound is a combination of classic heavy metal and modern power metal, mixed with some thrash and speed metal elements. If you like your metal true, up-tempo and aggressive, DEATH DEALER is your band. 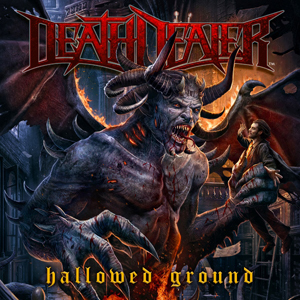 The album opens with the spaghetti western-themed “Gunslinger”, a track which chronicles the further exploits of the character called DEATH DEALER, this time in the old west. Peck’s lyrics paint some great visuals and the song includes some cool references to westerns like Hang ‘Em High and a musical nod to The Good, The Bad And The Ugly. Next up is “Break The Silence”, the first single/video released from the album (Checkout the video HERE). This is a solid track featuring lyrics of defiance and empowerment. “Plan Of Attack” follows, which is another awesome Sean Peck Marvel comics character study. Having already written songs about Galactus, Ghost Rider, Scarlet Witch and Dr. Doom, Peck has now penned this classic about Iron Man. One of the best songs on the album for sure. “Séance” is another great track, which finds the band creating an eerie mood no doubt inspired by gothic movies and TV shows. Peck shows off his range on the song. “Llega el Diablo” follows, an acoustic track performed by Ross The Boss that segues into “Way Of The Gun”, another western-themed track, this time from the point of view of the sheriff. The band slows things down to a mid-tempo on this track and it works, with fantastic bass work by Davis and Ross’ tasty solo also adds a nice flair. “K.I.L.L.” is a speed metal anthem that features some crushing double bass from Bolgnese, soaring vocals from Peck and awesome solos from Ross and Marshall. Another standout track. “I Am The Revolution” became one of my favorites on the album. The attitude, lyrics and message click with me. “Total Devastation” tells a dystopian tale about the end of the world. The song begins with a spoken intro, followed by a piercing scream by Peck. A crushing track, featuring great work by the entire band. Marshall’s solo is impeccable. “The Anthem” is one of the best heavy metal anthems ever written, destined to get the fans pumping their fists and banging their heads. It is another of my favorites songs on the album. “Corruption Of Blood” is another solid track that tells of a king’s reign during the dark ages. The twin guitar solo here is another winner. DEATH DEALER gives RUNNING WILD a run for their money on the pirate-themed “Skull And Crossbones”. Bolognese performs some killer fills on this song. The album ends with “U-666”, an excellent track about an evil German submarine during World War II. The tale is partially inspired by the USS Eldridge and the Philadelphia Experiment in 1943. The album has a total of 13 songs, clocking in at about an hour. The cover artwork and layout are fantastic and make a nice package. Every so often an album comes along that takes things to the next level. DEATH DEALER have laid claim to the throne with Hallowed Ground; this album will definitely be in my consideration for album of the year. It should generate a reaction worldwide and garner the band many new fans, because Hallowed Ground simply crushes! DEATH DEALER is a great band and Hallowed Ground is a powerful album you should be listening to!